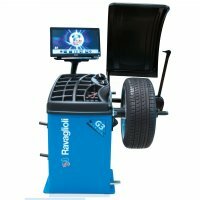 A wheel balancing machine loaded with value and features new graphics and features and easy to use video display. The inner distance/diameter gauge also measures rim eccentricity. 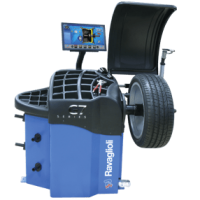 The new G3.140R Smart balancing system by Ravaglioli offers high end features at a mid range price level. This versatile system allows you to customize your machine from a large range of accessories and features. The machine can be accessorized as a basic video wheel balancer or can be outfitted with digital data arm so that it becomes a complete diagnostic balancer capable of measuring tire and wheel runout condition. High end features include laser pointer, LED lighting of wheel interior, ECO weight program, and much more. 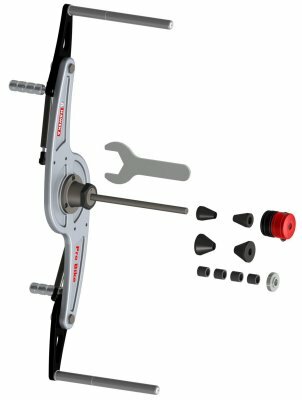 The G3.140R has no external data entry arm, the G3.140RS has the external data entry arm for the 3rd wheel parameter.